Easter is fast approaching and supermarket shelves are getting fuller and fuller with chocolate eggs making it even more difficult to resist those chocolate cravings , doesn’t it? The number of people with a sweet tooth for chocolate are many and often suffer from the dreaded chocolate cravings. Chocolate is sweet, smooth and divinely “sinful” and those who say they can easily resist a bite are certainly not referring to C-H-O-C-O-L-A-T-E. Those cravings are often triggered by our emotional state such as boredom, anger and depression, as well as environmental influences such as walking past a Chocolaterie. Research has shown that chocolate has many positive health effects like boosting your mood and brain power. Still, allowing yourself to cave in to your weakness can be detrimental to a healthy diet or weight loss goal. Exercise is good for you, we all know that and walking is one way to do it. A study led by researchers at the University of Innsbruck in Austria found just 15 minutes of exercise can keep you from indulging. The test involved 47 people some of whom took a brisk 15-minute walk on a treadmill, while others sat quietly for 15 minutes. Afterwards, the researchers tried to heighten their chocolate cravings even more by boosting their level of stress. Additionally, as soon as you’re out of the door, you’re away from temptation anyway. As long as you do not take your wallet with you and your walk involves paying a visit at the closest store! Set yourself a time limit, 20 to 30 minutes, and then if you still want to eat chocolate, you can have some or, you can have some of the alternatives mentioned below. Usually, however, if you allow yourself this period before succumbing into your craving, you will find that your chocolate craving diminishes significantly or it can even disappear. Fruit is a good alternative to other sweet treats that are full of fat and calories and is good for your body too. Some good choices are oranges, grapes, grapefruit, watermelon, melon, strawberries, blueberries, and bananas. Fruit smoothies are also a good alternative that will also boost your energy levels. Moderation is the key. 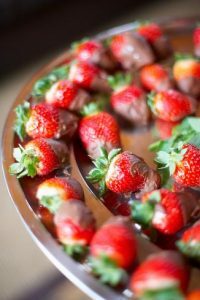 Allowing yourself to have a little chocolate every now and then is not going to do any harm to your healthy eating plan. Nor will having a small piece of chocolate once or twice a week. However, if you eat an entire chocolate bar or big piece of cake daily then things can quickly get out of control. You have to be able to have some control if you do choose to include chocolate in your diet. Try eating 70% cocoa chocolate or higher as your ‘chocolate treat’. Dark chocolate, in moderation, is actually good for you. It is full of antioxidants, which help protect the body from aging, high blood pressure, high cholesterol, and heart disease. Remember though to stay away from dark chocolate that contains nuts, caramel, or other fillings. To keep yourself from going back for more, after having your portion of chocolate, brush your teeth or have a minty gum. The minty taste will remove the heavenly taste that lingers and will also makes your mouth feel clean and fresh. 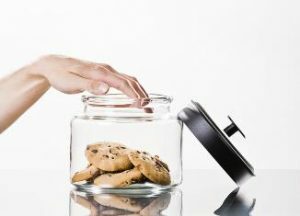 Do you have any good tips on coping with cravings? We would love to hear them.